Who Moved My Cheese (wheel)? There are no words to explain this. Perhaps British folk like Patrick can explain. Cheese rolling is a sport, according to ESPN's E:60. It's just like the running of the bulls in Pamplona, except it's in England, and you're chasing cheese instead of bulls chasing you...ok, so it's not really like running of the bulls, but makes about the same amount of sense. People stand at the top of the concave Cooper Hill in Gloucester every year, usually in costume, and some old guy rolls a wheel of specially made Double Gloucester cheese (Diane Smart apparently makes the best), and then...they run straight down the hill after the cheese. First one to make it to the bottom and cross the line wins. This guy is Chris Anderson, a local gas station attendant (as he is described); he's a town legend and has won the cheese a LOT. Apparently he's retired now, but he may be "tempted" to come back next year. Also the star of the Maccabees' "Can You Give It" music video. I could totally be the star of a music video, considering all of the brownies and cupcakes I chase and catch. The race itself is about 200 years old, according to legend, and has been summarized as "twenty young men chasing a cheese off a cliff and tumbling 200 yards to the bottom, where they are scraped up by paramedics and packed off to hospital." The final race of 2005 had to be delayed "while the ambulances returned from the hospital, all of them having been required to transport casualties from previous races." How does this not sound like fun? ESPN said the race may date back to Roman times, or may have been a pagan healing ritual. I don't know what it would heal - lactose intolerance, maybe? The E:60 video is only about 3 minutes long, and it's worth the watch (not the one E:60 aired, but a compilation of its feature). Beware of men in thong sling-type suits. Watch for the "Cheese Rolling Historian," a title akin to The Daily Show's "senior (fill in the blank) correspondent." I can't help but laugh at these people flopping through the air like flubber. Inspired, I checked out the Google for other wacky sports and came across Mullet Tossing. I was so excited - how do you toss a mullet?? 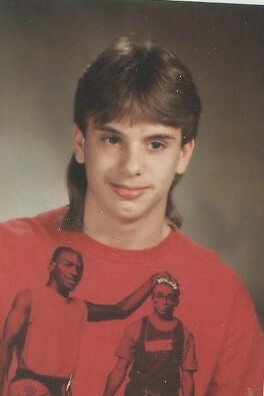 I clicked on the link expecting many hilarious photos reminiscent of every single high school yearbook photo in the late 1980s and early 1990s. Sadly, it's a fish. Not nearly as funny as this guy. The husband in his "prime."